Did you know that Pikachu, Squirtle, Eevee and Mewtwo can help teach science, technology, engineering and math (STEM) concepts to elementary school kids? The popular Pokémon Go characters are part of a project at Dakota State University (DSU) in Madison, SD. Juniors in a technology in education class used the smartphone-based augmented reality game late last month to teach local fourth graders concepts such as photosynthesis, gravity and the transformation of electricity. The children from St. Thomas School in Madison actually came up with the STEM ideas. They accompanied the college students to Memorial Park near campus to find the Pokémon creatures and also make STEM-related observations with the augmented reality images they captured. No modifications were made to the location-based game, developed by Niantic. After the children found the creatures and captured images, they returned with Geary’s students to DSU to make concrete STEM-related observations and calculations. They explored photosynthesis in the grass and leaves, the math behind building a bridge, gravity involved with the slide in the playground, and friction between a road and car tires. But he definitely predicts returning to Pokémon Go next fall. 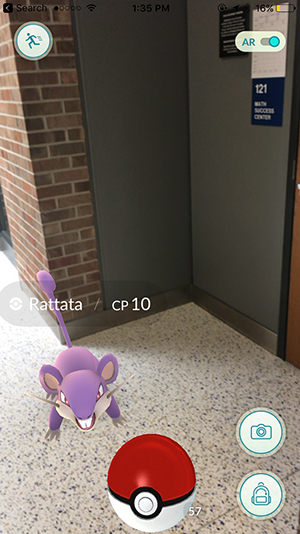 Geary also sees potential for other instructors to use Pokémon Go in their classrooms. “The teachers are going to invoke their own creativity in it,” he said.